Three men were killed and one man was wounded in a shooting in Palmdale, authorities said Thursday. 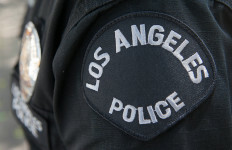 Deputies responded about 11:15 p.m. Wednesday to a call of a gunshot victim in the area of Ranch Center Drive and 40th Street West and located four men in two cars parked at the location, all suffering from apparent gunshot wounds, according to Deputy Marvin Crowder of the Los Angeles County Sheriff’s Department. Three of the victims were pronounced dead at the scene and the fourth was taken to a hospital in unknown condition, Crowder said. Anyone with information about the shooting was urged to call the sheriff’s Homicide Bureau at (323) 890-5500 or Crime Stoppers at (800) 222-8477.